Kobe Bryant reflected on his Lakers tenure as new turmoil permeated the Lakers locker room. LOS ANGELES — While Kobe Bryant sat on the nightclub stage, in front of a sold-out crowd of adoring fans whose credit card memberships afforded them the rare opportunity to be in his presence, the Lakers’ dismal, dysfunctional season reached new depths and the five-time champion’s farewell tour officially reached “The end can’t get here fast enough” status. Twenty-four hours earlier, the 37-year-old Bryant had posted the worst plus-minus of his 20-year career during a 48-point loss to the Jazz, by far the worst defeat of his time with the Lakers. Here, among friends inside the Bryant bubble, the loss—and his last three seasons of decline—went unmentioned. 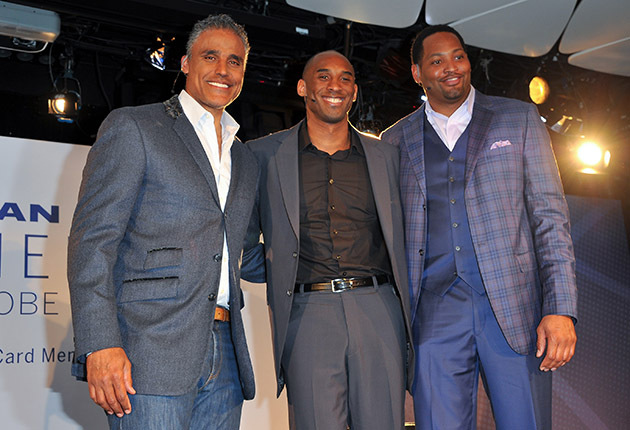 Bryant and former Lakers teammates Robert Horry and Rick Fox—brought together by American Express on Tuesday night for the 90-minute “Teamed up with Kobe Bryant” event at the Conga Room in Downtown L.A.—instead immersed themselves in decade-old memories of their shared three-peat. Fox thanked Bryant for greeting his daughter during All-Star Weekend, making her day. Horry laughed about teaching Bryant how to play Spades on the team plane. Bryant, dressed in a grey suit, black shirt and no tie, ribbed Fox for lifting weights in front of a mirror in the team’s practice facility, wearing only spandex, socks and shoes to “get himself going.” They all sounded like old-timers, Bryant included. Just as Bryant’s event wrapped, ESPN.com published a report that 20-year-old Lakers rookie D’Angelo Russell has become a locker room outcast after he videotaped teammate Nick Young, who is engaged to rapper Iggy Azalea, discussing other relationships. That report came little more than a week after Young and Jordan Clarkson were accused of sexual harassment by a female activist. On the court, Bryant has never meshed with the younger members of the rebuilding Lakers this season. Lakers coach Byron Scott constructed a reality in which Bryant still leads the team in scoring and shots, even though he’s hitting just 35.7% of his attempts. Russell, the 2015 No. 2 overall pick, was moved to the bench for a good chunk of the season, in part to stagger his minutes with Bryant so that he could enjoy a greater number of touches. The Lakers are on track for their worst winning percentage in the 68-year history of the franchise, and Bryant has been so unimpressed with his younger teammates that he dismissed the idea this week that he was “passing the torch” to them, suggesting that they hadn’t yet earned it. Bryant knows better than anyone the type of scrutiny that his younger teammates must face, having generated more than his share of unwanted off-the-court headlines earlier in his career. In 2003, he was charged in a sexual assault case in Colorado while married to his wife, Vanessa. The legal proceedings led Bryant to fly back and forth between court dates and games. Rumors of discord between Bryant and former teammate Shaquille O’Neal were often traced back to that incident and its aftermath, and O’Neal was traded to Miami in 2004. For much of this season, Bryant has struggled with his body, missing games, skipping out on transition defense, and undergoing endless hours of treatment to get on the court. But his age has never been more evident than it was Tuesday, as he invited Fox to visit his Newport office space after the season, marveled at his daughter Gianna’s potential future as a WNBA player and lamented a loss to the Spurs in the 2003 playoffs. Bryant is old enough now to joke about his days as a stubborn, know-it-all immature teenager. Asked what advice he would give to the 17-year-old version of himself, Bryant replied: “No matter what I say, I wouldn’t listen to me anyway.” In this, Bryant’s account of his early days sounded a bit like Russell, who recently told the New York Times that he “didn’t care at all” and “didn’t deal with it at all” when Scott made headlines by publicly calling out his immaturity earlier this season. Still, with the end so close and months of gifts and goodbyes behind him, Bryant claimed that he hadn’t really processed how close he is to retirement, and what that means. His satisfied, uplifting message was met with loud applause. Within minutes, those clapping hands would return to their smartphones, where they would pull up salacious stories about a split Lakers locker room. Perhaps this juxtaposition was exactly the moment Bryant was seeking. Can there be any doubt with whom he now shares more in common: Horry and Fox, or Russell and Young? Can there be any doubt where he looks more comfortable: In a corporate setting cashing in on his years of built-up fame, or on the court surrounded by a largely anonymous and frequently changing supporting cast? For Bryant, can there be any doubt now that professional basketball is a younger man’s game?